The part of Prospect Heights between Eastern Parkway, St. John's Place, Plaza Street and Washington Avenue was originally set aside for Prospect Park. Later the Park Lands were sold and slated for townhouses. 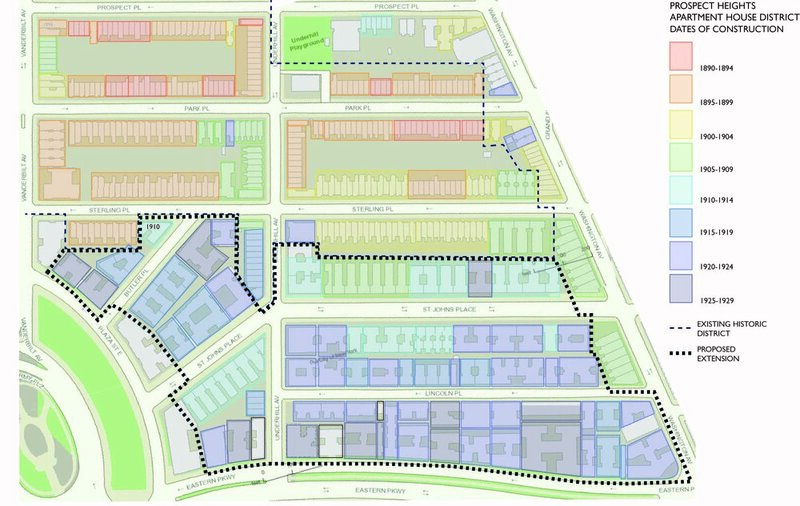 But by the early 1900s developers consolidated the lots and built multifamily dwellings. These buildings, erected between 1909 and 1929, created one of the first "modern" apartment house districts in Brooklyn. A neighborhood was born. This neighborhood was identified by the Historic Districts Council (HDC) as one of six in New York City to merit preservation. "Constructed on a lost fragment of the original footprint of Prospect Park, now in southern Prospect Heights, is a concentration of 82 apartment buildings dating from 1909-1929. This development, boasting a cohesive design vocabulary and scale, was promoted by the Prospect Park Commissioners to attract high quality construction to complement the nearby Park, Brooklyn Museum, Brooklyn Botanic Garden and Brooklyn Public Library. The buildings, representative of a period in Brooklyn history when building patterns shifted to accommodate a rising middle class, remain exemplary for their architectural integrity and as housing stock for a diverse population." Full announcement here. Since their construction, the buildings of the Prospect Heights Apartment House District have seen relatively little change. Unfortunately, current and future development pressure may now threaten the character of this unique section of Prospect Heights that each year welcomes thousands of visitors to Brooklyn’s premier cultural institutions. Excess development rights, combined with a superheated real estate market, make many properties within the Prospect Heights Apartment House district potential targets for uncharacteristic additions, or even redevelopment. Our community has a chance to preserve this part of our history before it is too late. By designating an Prospect Heights Apartment House Historic District, we can work to ensure this unique part of the architectural legacy of Prospect Heights will be enjoyed by residents and visitors for many years to come. But your support is critical. JOIN US and support the preservation of the character of our neighborhood! This is a joint project between CuRBA and the Prospect Heights Neighborhood Development Council (PHNDC).